This tutorial explains how to attach a file from clipboard in Mozilla Thunderbird. This feature is not supported natively in Thunderbird email client, but it is possible to attach a file from clipboard in Mozilla Thunderbird using a free add-on. You will be able to attach an image (PNG, JPG, etc. ), TXT file, Word file, HTML, and other supported files directly from the clipboard. Do note that this add-on that I have used can attach only one file at a time. So it won’t be helpful when you want to attach multiple files from clipboard in Thunderbird. The add-on is named as “Attach from Clipboard“. After installation, this add-on provides Attach from clipboard option in all the possible attachment options (attachment box, File menu, Attach button drop down menu, etc.) that are used to attach files in an email when using Thunderbird email client. You also don’t have to configure options to make this add-on work for you. It becomes ready right after the installation. 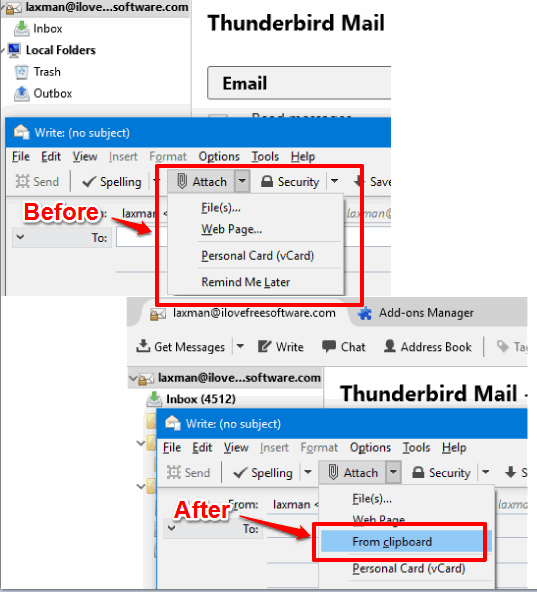 In the screenshot above, you can see before and after comparison for one of the attachment options in Mozilla Thunderbird. Earlier, there was no option to Attach file from Clipboard, but after installing this add-on, that option is visible. How To Attach A File from Clipboard In Mozilla Thunderbird? Step 1: Use this link to open the homepage of this Thunderbird add-on. Download the add-on (XPI file) and open Mozilla Thunderbird. 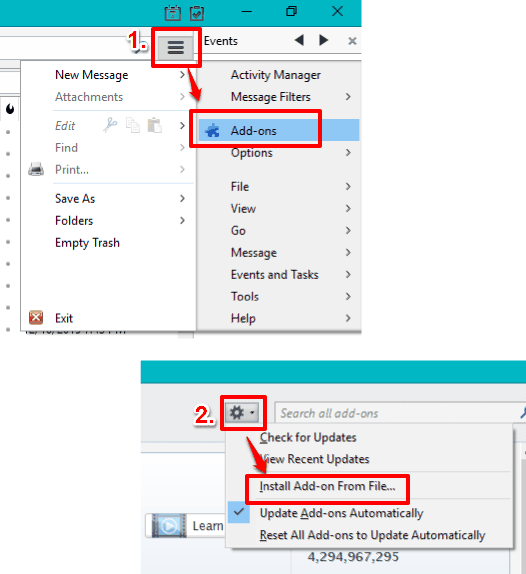 Step 2: Explorer Thunderbird menu by clicking the three horizontal lines icon (available at the top right corner) and then click Add-ons option. Step 3: Add-ons Manager tab will open. In that tab, click the Settings icon, and then select Install Add-on From File… option. See the above screenshot. This will open a window using which you can select XPI file of this add-on that you downloaded and then install this add-on. After that, you need to restart Thunderbird so that add-on can be installed successfully. You can press Alt+Shift+V hotkey and it will automatically add the last copied item from clipboard to email as an attachment in Thunderbird. You can right-click on Attachment box and you will see that Attach from clipboard option is visible. Click File menu, Go to Attach, and From clipboard option will visible. Click on drop down icon of Attach button and From clipbard option will visible to you. 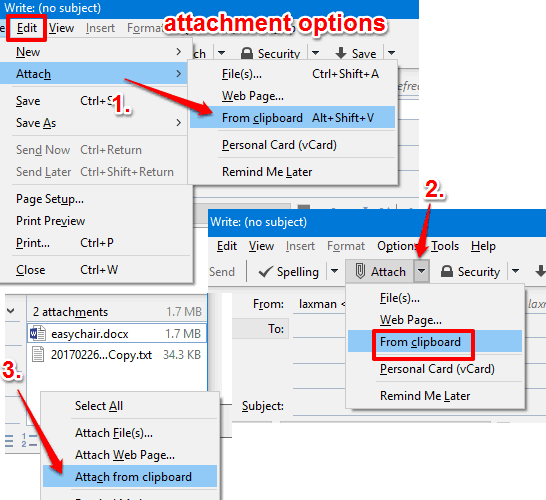 Use any of these options to attach a file from clipboard in Mozilla Thunderbird. You can also learn to Add Gmail Conversation View in Thunderbird and Manually Arrange Folders and Accounts in Thunderbird. Attach from Clipboard is an amazing add-on for Thunderbird which makes it possible to atttach files from clipboard, which is not possible natively. I really wish it would had provided feature to attach multiple files, but only one file can be attached at a time. Still, this is not bad as we at least have option to attach an image, text, HTML, or some other supported file directly from clipboard to Thunderbird.